This kit includes a refurbished fuser, pickup roller, and separation pad. 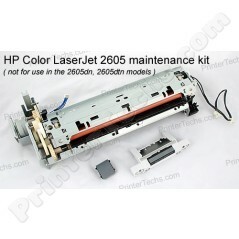 It is compatible with the simplex-model HP Color LaserJet 2605 (not for use in the duplex models, Color LaserJet 2605DN, 2605DTN models). You can also save some money by purchasing this kit with fuser exchange, see the details below.